Explanation: Our Milky Way galaxy appears to be surrounded by a halo of gamma rays. Gamma rays are the most energetic form of electromagnetic radiation, with more than a hundred thousand times the energy of visible light, but known gamma-ray sources don't account for the diffuse distribution of this high-energy glow. This surprising result is based on data from the EGRET instrument onboard the Compton Gamma Ray Observatory. In this false color all-sky image centered on the Milky Way, the brown and green regions indicate brighter, known sources of gamma-rays. The galactic center and plane clearly standout as do some distant galaxies seen near the top and bottom of the picture. The dim, blue regions above and below the plane correspond to our Galaxy's unexpected gamma-ray halo. What causes the halo? 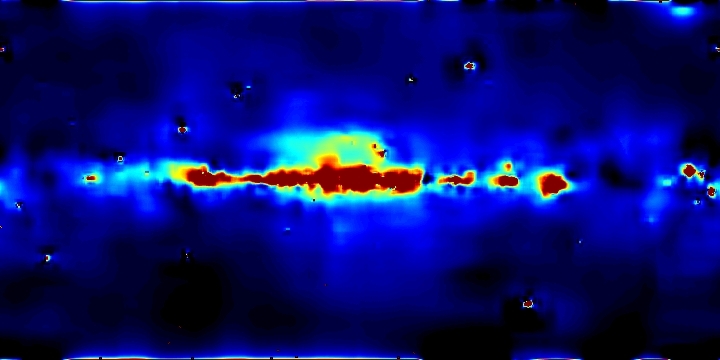 Future gamma-ray telescopes could solve this mystery. However, the excitement has already inspired tantalizing speculation about the solution including; collisions of low energy photons with high-energy cosmic rays, high energy electrons accelerated by a previous burst of Milky Way star formation, and exotic interacting particles which make up Dark Matter.